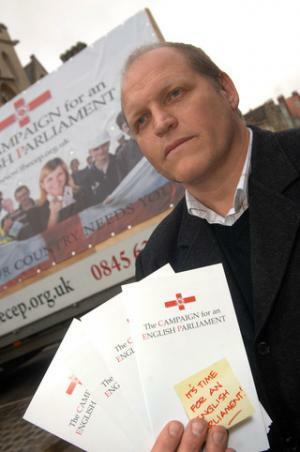 However, whilst he has been very vocal on the issue of self-determination for the Palestinians for a number of years, the following article from Eddie Bone of The independent lobbying group, Campaign for an English Parliament (CEP) shows that he is not so keen on extending self-determination to the English – Indeed, he supports the EU plan of breaking England down in to regions as can be seen on the following video! Mr Eddie Bone, Campaign Director for the Campaign for an English Parliament. The Campaign for an English Parliament attended the ‘Jeremy Corbyn for Leader’ event that was held in Ealing on the 17th August 2015. As the Campaign Director of the Campaign for an English Parliament I asked a question during the Q&A section, after Jeremy Corbyn’s main speech. We asked if he would establish an English Labour Party. His reply was direct and dismissive as he stated ‘he didn’t support an English Labour Party as he didn’t see the need for it’. We thought it showed a lack of insight into the complex concerns being expressed by many Labour supporters, so we attempted to highlight the clear differences in policies between the nations of the UK (eg Tuition fees). After the event we attempted to speak with Jeremy Corbyn so that he could clarify why he talked about equality and fairness for all yet didn’t appear concerned about England and the English. Tragically for the Labour Party, Jeremy Corbyn appeared not to grasp what the Conservatives were able to grasp during the general election. Admittedly it took an Australian spin doctor, Lynton Crosby to eventually help the Conservatives see the advantage of playing the English nationalist card. But it did help them ‘above all expectations’ to win a majority. It also helped ‘Northern UKIP’ to block Labour’s ability to challenge the Conservatives as well.